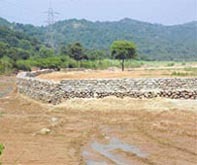 Following the expose of cases of violation of the forest cover by well-connected persons in Chandigarh’s periphery, the Punjab Forest Minister, Mr H.R. Joshan, has constituted a high-powered committee to probe the violations in Ropar district. To facilitate the general public and reduce the time in getting the sanction of building plans, the Chandigarh Administration has announced an optional scheme for self-certification of building plans. 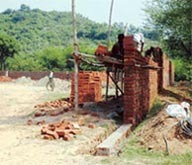 The scheme will apply only in case of residential buildings. A call to an unknown girl listed in the phone book of a murdered UT police constable led to the tracing of the accused. 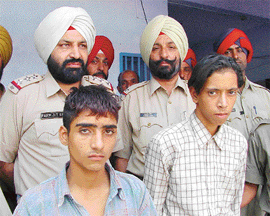 Claiming to have solved the blind murder case of 38-year-old Constable Gurdev Singh with the arrest of two youngsters, the Punjab Police said the accused handed over the phone to an electrician to change its body. A 55-year-old clerk working in Sector 9 Kendriya Sadan died after falling from the fourth floor of the building this afternoon. The police has not ruled out the possibility of suicide. No suicide note was found from the body, the police said. India and the United states are extremely concerned at the growing number of afflictions from malaria, HIV and tuberculosis that together kill 8 to 10 million people every year globally. The challenge has become tougher with the emergence of drug resistance to these diseases. It is not the VIPs alone who are consuming precious time of the Chandigarh police. The police on an average takes care of an estimated 800 dharnas and over 150 processions every year. Besides, the men-in-khaki assist the municipal and other authorities in anti-encroachment drives, even examinations held from time to time. The Chandigarh Housing Board has decided to float a scheme for 96 dwelling units under a two-bedroom housing category in Sector 49. A decision to this regard was taken at a meeting of the Board of Directors here today. The IAF today stepped up its relief and rescue operations, launching a large number of sorties from various airbases to ferry relief material to quake-hit areas of Jammu and Kashmir. The mortal remains of Major Gen Narinder Singh were consigned to the flames at the Sector 25 electric crematorium here today. 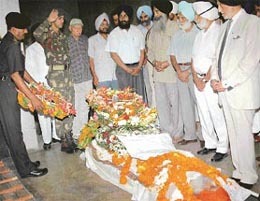 Gen Narinder Singh, 86, was given a tearful adieu by family and friends. The road cutting through the “institutional area” in Sector 26 continues to be unsafe. Less than a week after a youngster was killed and another injured in two different mishaps on the same road, another student succumbed to her injuries in the wee hours today. The three victims of alleged police brutality on the CIA premises — Sumit, Mukesh and Raju — were today produced before police officers investigating the matter for recording their statements in the presence of policemen. Terming the recent Congress Chief Ministers’ conclave as a “flop show”, a former local MP, Mr Satya Pal Jain, yesterday alleged that it had failed to come out with solution to the problems facing the common man. Local SAD and BJP leaders have condemned the exorbitant hike in the water and sewerage charges and the installation of electronic meters in the town. A symbolic rally will be organised by them on October 14 outside the office of the municipal council as a mark of protest. Leading experts on India’s foreign policy and national security will be here for two days from October 15 to deliberate upon “India’s Foreign Policy and National Security”. The Chandigarh Administration has decided to increase the quantity of sugar for the below poverty line (BPL) card holders from the existing provision of 1 kg to 2 kg. The revised quantum will be effective in October and November. For the owner of a factory in the Industrial Area here, it was “harassment” for the second time. Less than three months after thieves decamped with two-and-a-half quintal copper costing over Rs 2 lakh, the outlaws broke into the premises once again last night. This time, they managed to escape with copper wire worth Rs 30,000. A student sustained injuries after a clash in Sector 71 here today. He was taken to the Civil Hospital. Manu Multimedia Pvt Ltd launched the XIIth edition of Chandigarh Yellow Pages (2006-2007) on the occasion of Durga Astami today. It is a useful business guide for multinational companies keen to set up base in Chandigarh, Mohali and Panchkula. Ring tones have come a long way from the days of the boring tring-tring to monotone sing tones, true tones and now video tones. For, Spice Telecom today launched video tones service in Punjab, becoming the first operator to do so in the region. A 21-day refresher course on “Human rights and gender studies” concluded on the Panjab University campus today. It was organised by the Departments of Sociology and Political Science and the Centre for Women’s Studies. The refresher course focused on various aspects of the human rights and gender studies. 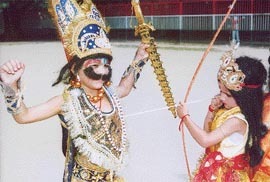 Students of St Soldier International Convent School enacted Ramlila to celebrate Dasehra. The management, Principal, staff and senior students were the audience. The little artistes efficiently portrayed the characters of the Ramayana on the stage. The background music augmented their performance. Principal V. Tiwana appreciated the talent of the students. Dasehra was celebrated with traditional fervour in city schools here today. 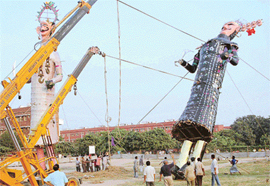 The effigies of Ravana, Meghnatha and Kumbhkarna went up in flames to mark the conclusion of the celebrations. Pepsi symphony 2005 conducted a talent hunt round at St. Soldier International Convent School, Phase VII, here yesterday. As many as 13 budding artists, singers performed on stage. Satish Shah, a noted composer, was the judge for the day along with the host, Mr Gaurav Shah. The key to success lies within you. All you need to achieve it is proper guidance. Everything is possible if you set a particular aim and work hard to achieve it. As many as 25 students along with faculty members, Dr Sarita Saini and Mr Kulwinder Singh, of the Shivalik Institute of Education and Research, Phase 6, here marked Senior Citizens Day by visiting Old People’s Home, Sector-15, Chandigarh, today. The Chandigarh District Consumer Disputes Redressal Forum-II today issued notice to the management of Fun Republic and the UT Administration for November 21 on a complaint alleging overcharging and unfair trade practices by the multiplex in Mani Majra. The soulful renditions of ghazals by Sakhawat Hussain Khan ‘Nishat’ of the Rampur gharana enthralled the audience on the occasion of the 102nd Baithak Programme of Pracheen Kala Kendra here today. 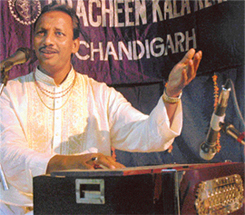 Nishat is the grandson of the first recipient of the Padma Bhushan award, Ustad Mushtaq Husain Khan. The opening of a dispensary at the District Courts in Sector 17, the long-pending demand of litigants and advocates, seems to have run into rough weather for the time being. City Beautiful can now boast of a neurology hospital. Inaugurated yesterday, the Northern Institute of Neuro-Sciences is a joint venture of three neuro-surgeons from the PGI and AIIMS. Local sportspersons are perturbed over the non-appointment of a full-fledged Union Sports Minister the post which fell vacant after the death of Sunil Dutt. Sports lovers are not happy with the way sports has been ignored. The Chandigarh Golf Club is all set to present a special new year's gift to the golf lovers. Come January, its three fairways — 1st, 17th and 18th — will be flood lit giving the members an opportunity to enjoy a round of golf even late at night. A fine knock of 41off 42 balls by Subeer Hayer today enabled YPS, Mohali, to beat Little Flower Convent School, Sector 14, Panchkula, by seven wickets in the ongoing Edmund Rice U-11 Cricket Tournament at St John's High School, Sector 26, here. Delhi HC beat CLSA (Black) by 40 runs in a match of the All-India-Inter High Court Lawyers Cricket Tournament, held at the Sector 16 Cricket Stadium here today. After the registration of FIRs against persons who have carved out and sold plots in the periphery of UT villages, now it is the turn of erring jhuggi dwellers to face the ire of the Chandigarh Administration. Advocates at the Panchkula District Courts held a rally and raised slogans against the district administration against the “illegal” demolition of the temporary sheds being constructed by the advocates under a self-financing scheme. Offices of the Chandigarh Administration have very poor arrangements for implementation of the Right to Information Act which comes into force from October 13.